I haven't been thrifting or yard sale hunting in a long while, but while on the way to a nursery yesterday I spied a sign around the corner of my apartment for a vintage sale. I was enjoying a rare day "off", how could I resist a peek? What I pulled up to was amazing! 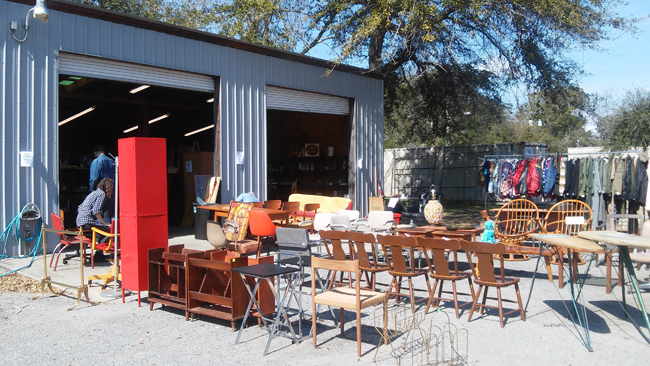 It was a storage shed full of vintage furniture, clothing, and more from the 1960s and 1970s! How did I never know this was minutes away from me? It's directly behind Flaire Antiques which I shared here. Look how organized and neat the lines are in this set-up! 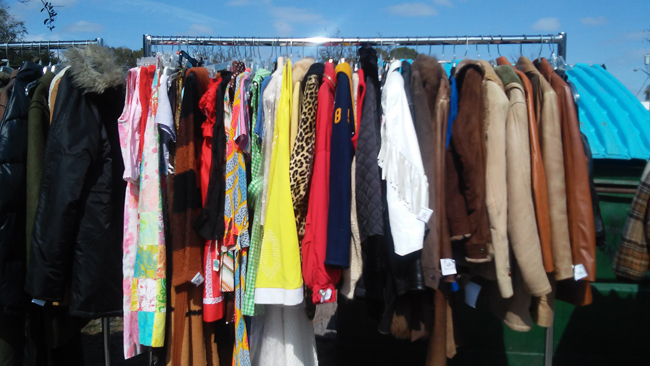 The clothes were beautiful and well-priced (antique mall type prices vs. yard sale). I was tempted to get a jacket but I feel uncomfortable in stuff with faux fur for some off reason. 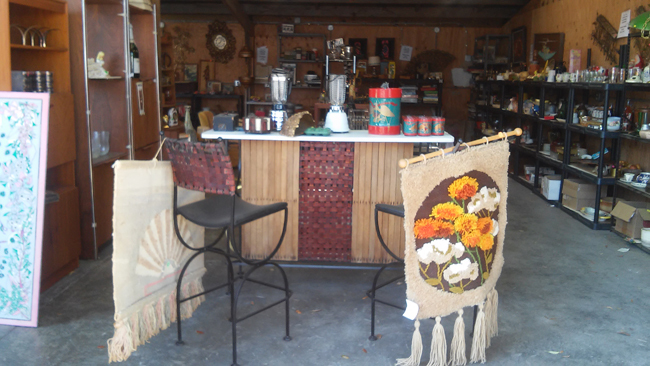 I loved the bar in the entrance of the shed, and there were several barware pieces I've seen around the SDCP offices from Mad Men. Beside the bar was a sight that made me swoon! 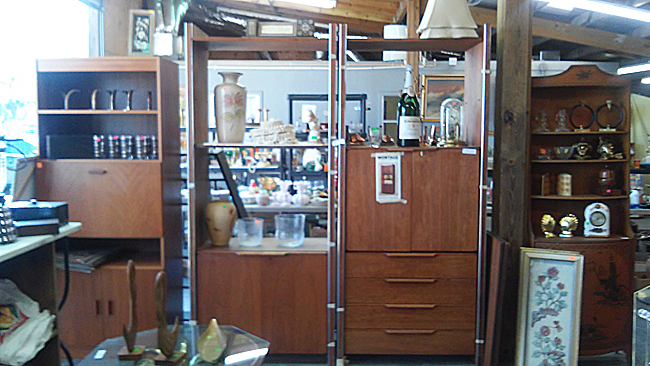 A retro free standing storage unit! Unfortunately, it can't accommodate a modern TV (which is what I'd use it for, thought it could easily replace my IKEA storage unit). Beautiful pieces! 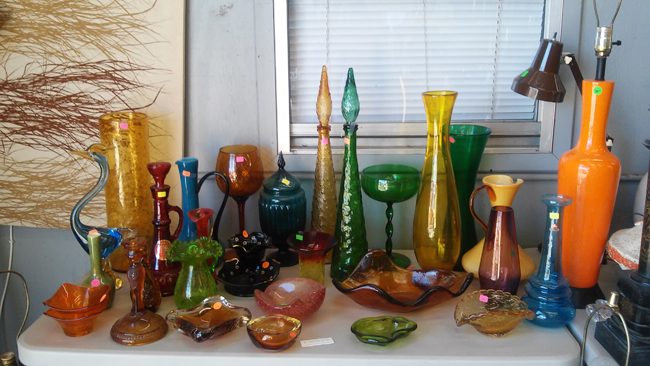 Now imagine the storage unite filled with gorgeous, colorful mod glassware. Beautiful. 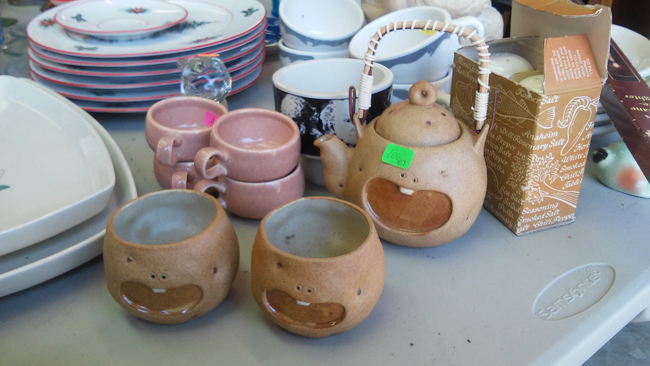 This unique hand-painted Japanese pottery was adorable. I have enough tea pots, but how can I not adore this expressive set? There was so much to take in and lust after! I was putting together beautiful mod room layouts in my mind while I browsed. And many little treasures hidden away, like this Merry Mushrooms set. 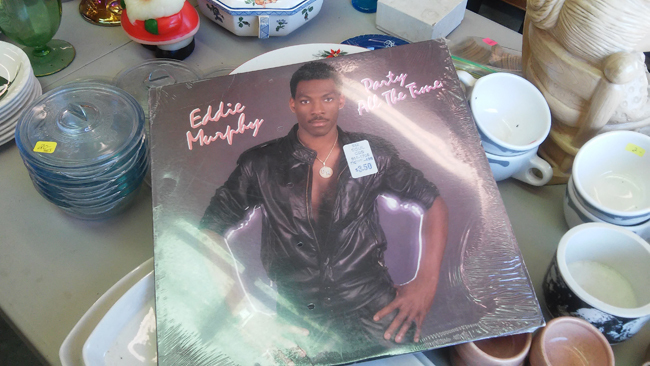 This awesome unwrapped single from Eddie's short-lived music career! 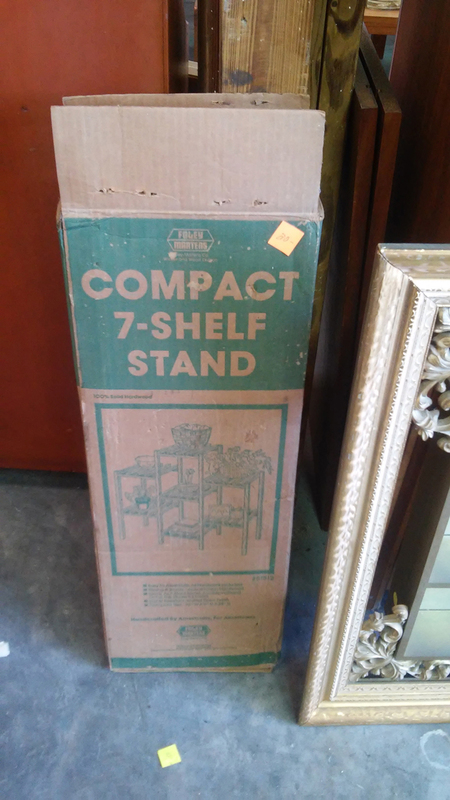 This compact shelf that was another little temptation. Love how it's covered with plants in the photo. 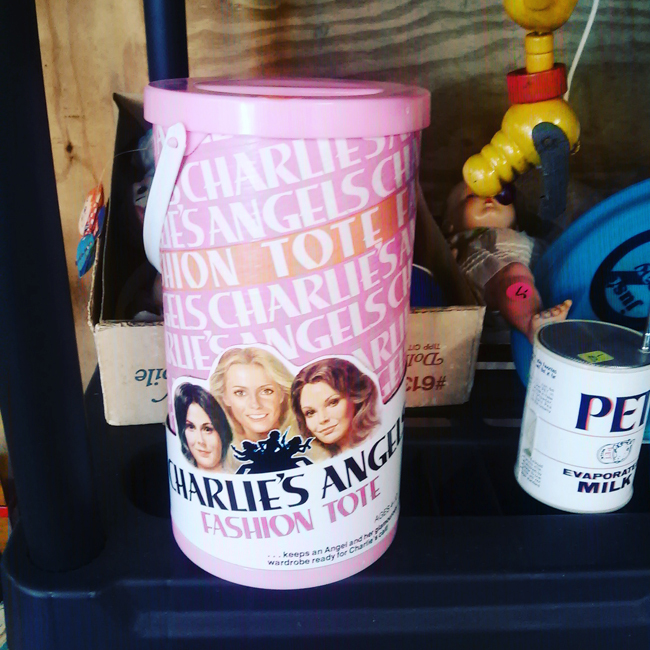 And of course, silly kitschy toys, I've never seen Charlie's Angels merchandise in all of my hunts. My favorite part of that silhouette in the logo is the kung fu hands! Chop! I was soooo close to buying the hell out of this! I've always wanted to make a collection of ceramics based on vintages ones, no better way to do that than with the actual molds. These forest animals ones is so cute. Should I go back for it? I left it because I'm still selling vintage I have on hand now (and so, so much more stuff!) and probably don't need another thing to do. Have you found anything good 2nd-hand shopping lately? It's been nice to be out of the game, now I can resist pretty much everything! My mom says the same thing, she cringes at most of the 1970s stuff that I love. ;) And then she's obsessed with the 40s-50s as a style muse. Sometimes we look a few decades back for inspiration. Haha, I think of packing and moving it all again (aaah!) & then it's easy. What fun finds! I love all the glass pieces. Nice to know it's just around the corner when you do decide to buy. They'll be moving to the next town over soon ;) of course, right after I find them! Put now I know they're around if I want to peruse. Cool that you found that nearby vintage hideyhole! Recently discovered something similar while looking around online, need to check it out soon. Haven't heard hideyhole in a while, live that word :) it's a good place to know just in case I urgently need a vintage fix. All disposable income is going to books/work supplies for now though, boooo! I get what you mean about jackets with so-called fake fur on them...I wouldn't feel good about that either. I suppose it was more of vintage store than a thrift store. Awesome deals for such a well curated collection. 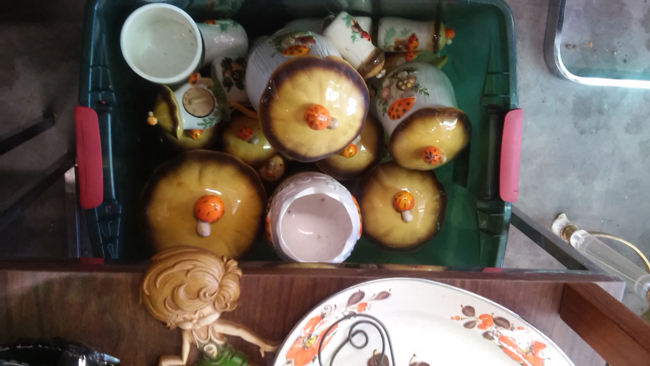 my mom still has some pieces of the Mushroom set. That's awesome! :) I had pieces of the set for a long while but sold 'em off. They're quite fragile! omg, I would have bought so much stuff!!! Haha ;) They were more like collector's prices than reseller prices but you surely would have found some treasures to sell and/or keep in that massive collection. Even if you don't buy it is still fun to hunt. On Friday I found an atomic Vintage Dansk candleholder for 50 cents that I could not leave behind (like this one http://www.ebay.com/itm/Vintage-Dansk-Designs-Cast-Iron-Candle-Holder-Decor-Metal-Denmark-Vint-/301577336889?hash=item463768f839:g:8wcAAOSw8d9U1q8G) at my favorite thrift store. I want to sell it on at some point but for now it will be treasured in my cabinet. The reseller-me might have ;) Nothing was in it though, just a cute case, but it will still make for adorable storage. Especially in the closet or bathroom. 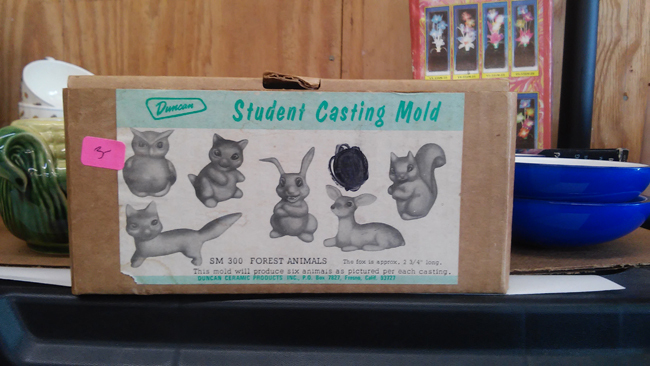 Looks like a fun place, and those molds look cool for a DIY project of some sort. 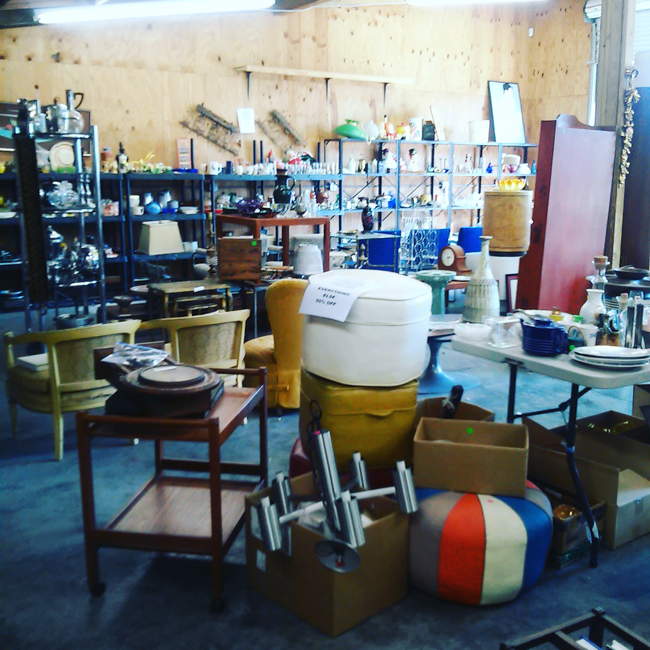 Lately I've avoided going to the thrift shop, because I am trying to get rid of my own stuff (thanks to Mari Kondo! ), the last things Ive gotten were some vintage postcards. 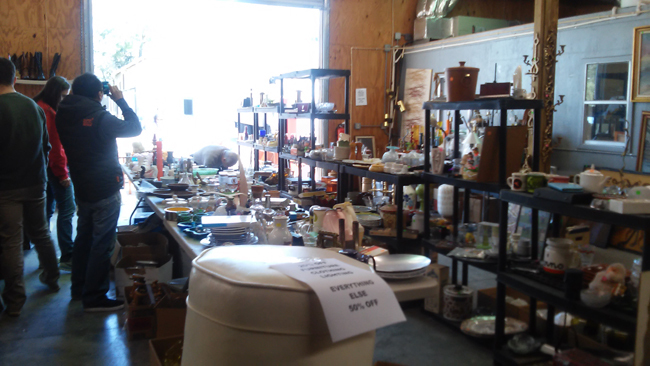 Same here, I very rarely thrift because I'm -still- after two methods sorting through things. I keep remembering things I forgot - mostly things still at my mom's house, etc. I've also never taken all the art off the walls and set it on the floor to evaluate, eek, so hard. Is this in Jax? Whereeeeee! I need those clothes... Vintage shopping is so bleak here.